In late 2018, a global survey was conducted to better understand how the attitudes, strategies, and practices of real estate investors, and fund and asset managers are incorporating Environmental, Social and Governance (ESG) criteria, and the degree to which they may need to strengthen their commitments so that their portfolios are aligned with the objectives of the Paris Agreement. More than 40 respondents with an aggregate AUM exceeding $1 trillion took part. 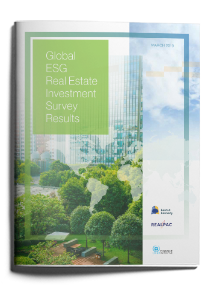 The report – Global ESG Real Estate Survey Results – summarises the survey results. It shows, for example, that the vast majority of respondents are taking ESG considerations into account for acquisitions and using ESG as a lever to lower risk, and that tenants and owners are presently asking and expected to demand more from asset managers to address climate risk. The findings offer a unique perspective and evidence base of the progress being made to mainstream ESG within large institutions, and that a strong platform exists for producing even greater positive changes within the sector to accelerate the decarbonisation of buildings and improve resiliency in alignment with the Paris Climate Agreement. Read more about responsible property investment and UNEP FI’s Property Working Group here.